A very rare test set was produced by Topps in 1968. It is unfortunate that this set never went into production and released to the public because they are good looking cards. Setting a lenticular plastic lens over the surface of the card gives the impression of a 3D image. Just like the Kellogg cards of the 70s and 80s and the Sportflics cards of the late 80s. The difference is the 1968 cards have a clean and simple design that would become part of the 1969 Topps design. The 3D cards are larger than normal cards which leads one to believe these would have been packed out as a separate issue like the Topps Supers and not inserts. As stated before, these are a test issue and are quite rare. They also command the price of a rare test issue. 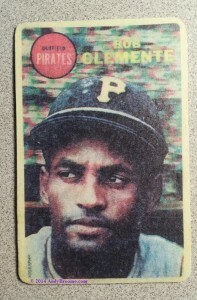 In 2012, a Gem Mint Roberto Clemente in a Robert Edwards auction sold for $30,000.00 hammer price. There have been uncut sheets sell at auction as well as singles. But we are here to discuss not the real cards but a fake version of the real cards. This card is a very easy one to spot. Right off the bat, there is no plastic lenticular surface on the card, it is bare stock. Although this fake is larger than a standard card, it is not the correct size. The print is terrible. It has the appearance of being printed using a color laser printer. Finally, the back is simply blank. The real cards have a message about the cards being an experiment and should be returned to Visual Panographics, Inc.